The following is the fifth page of an illustrated solution of the Easter Monster. If this is your first visit to this blog, WELCOME!! Forbidding Chains 101 The Theory. Note that I now use the term Alternating Inference Chain (AIC) to mean Forbidding Chain. Please be aware that, for me, strong and weak need not be mutually exclusive properties. Step 2j prelude using Kraken Cell Transport. 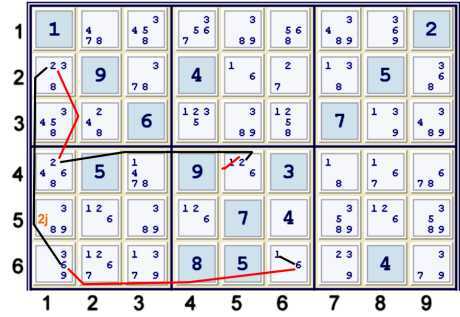 Since this puzzle resists most normal attempts to crack it, it seemed likely that some research might be required into relationships to locate good attacks. On the previous page, the guardian sis was used to locate a likely chain. Here, the relative symmetry of candidates 345 in relation to cells r7c9 and r9c7 caused me to create a transport list out of each cell. Basically, the goal is take the sis inherent in a cell and find some equivalent sis at least partially out of the cell. Although I created many such lists, some of them seemed more likely to be fruitful than others. In this case, the transport list for r7c9 seemed more likely to be fruitful than the one for r9c7, primarily because candidate 67 interactions uncovered in the guardian step. Above, I am illustrating three short transportation chains. 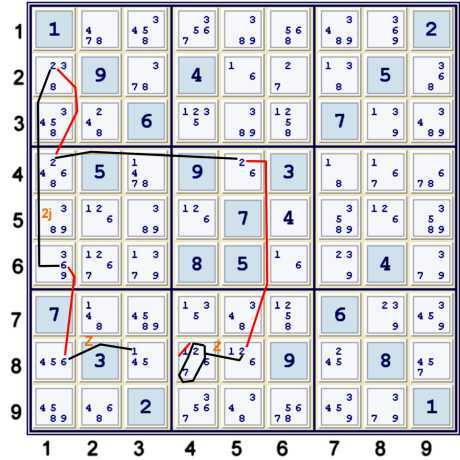 Note that there are many such chains possible, but I wanted one that interacted strongly with canidates 67. This new sis seems a bit unwieldy, but a short look at some of the previous chains considered makes it very promising. The only item that cannot be resolved easily is that darn (9)r7c9. However, one may see a potential logjam primarily because of sis[9 column 3]. Below, the transported portions of cell r7c9 are labelled with a green k. The rough order of chained sis are marked with brown numbers. Only strong inference sets are marked. The Z argument group is used twice, and labelled accordingly. This leads to a few relatively easy eliminations, although all of them use proven sis. Remembering what has been already proven certainly makes that one a breeze. Below, recall 2j sis [(2)r2c1=(6)r6c1]. Add a pair of native strong inferences. 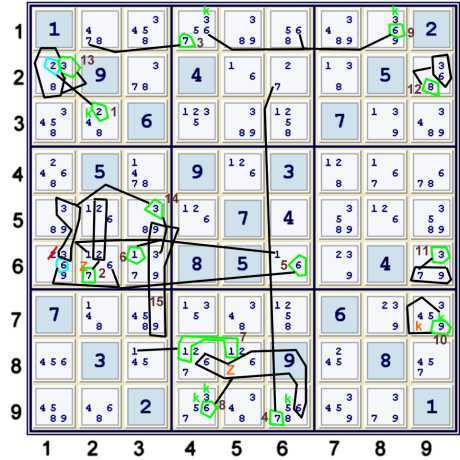 Below, recall 2j sis [(2)r2c1=(6)r6c1]. Add one native strong inference and use strong inferences from the Z group twice. After just a little practice, using derived strong inference sets seems just as natural as using native strong inference sets. Although the structure of a derived strong inference set may be a tad unconventional, the logic is precisely the same. Some large and unconventional weaponry seems warranted with this particular puzzle. The practical use of most of these ideas will be very small. However, mini-cases of the same logic type are possible. 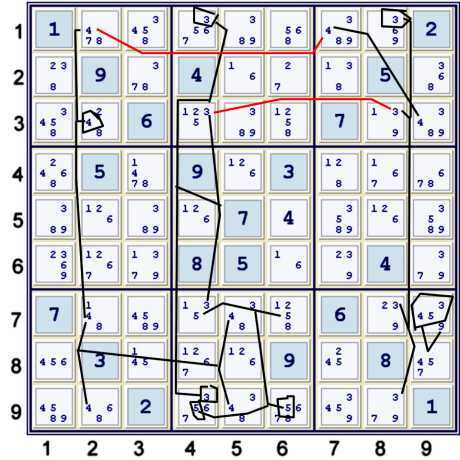 In all but a very few puzzles, the depth and complexity found here will not be encountered. I have a few more unconventional attacks to attempt. On the next page, I probably will employ an sis derived from an Almost Unique Rectangle - more aptly named, I think, a Forbidden Rectangle. Nobody work at others Site when you start...EM! I don't recall seeing the terms transport list or transportation chain in any of your other blogs. Can you please tell me where can I read about these? We are getting close. Next round will solve some cells. Then the puzzle starts to collapse, especially recognizing some of the absurd symmetry. Hopefully, it will finish long before Christmas! I am probably not the best person to ask. I generally read the Eureka forum and a little bit in the Players Forum. I sort of take what is written and translate into my own way of thinking.